Hi guys. Since my attempt to create a ship sharing hub for GOG users has blatantly failed and I created a couple new ship sets, I've decided to reorganize my releases and to create a new, massive pack that, from now on, will contain all the ship designs I create. As you can see, the version 1.0 contains some of my previous works (which won't be reachable from the old links anymore) and some new ships I hope you'll appreciate. If you have any comment, critic, suggestion or want to report bugs or issues just post here. See ya for next versions of the pack and have fun! Any chance on adding the ability to select these ship designs as a Ship Style in the Civilization Builder menu? I'm working to add it in the first update of the mod (alongside various bug fixes), so stay tuned. Well then I'll have to stay subscribed to your thread awaiting eagerly. It may be a bit early, but version 2.0, the first update for my mod, is now available (download link in the first post). As I said, this update contains the Shipset Template files, alongside a bunch of new designs and various bug fixes and redesigns for the old models (which is why I was able to prepare it so quickly, expect next updates to take some more time since thay'll add new shipsets and stuff). Thanks for the update! Great Job! Remember, if you have any comment, suggestion, critic or want to report any bug or issue just post here (especially bugs and issues, I checked for any problem but it's possible I missed something). Well, if you want to suggest an idea or a theme for a new shipset I'm ready to hear it and to try to realize it. Usually I choose a simple, generic idea (like "hull with a particular shape" or "equipment is placed in a peculiar way"), then I try to build the set around it. Of course, you will be credited for the idea. A little update: right now I'm doing some brainstorming to find ideas for new shipsets. I found a couple interesting ones, but didn't start working on them yet. Ok people, if you're checking the post "Post Your Gal Civ III Ship Designs!" you already know, for all the others I announce that I'm working on a new update for this mod, version 3.5. This update will be quite big, as it will contain a new ship set and over 20 new designs for the old sets. Release is planned for mid-March, however I can't guarantee, since first I need to decide if I should make the mod "Retribution"-ready or not. Lil update: work on the update is proceding steadly. However, now that "Retribution" has been released, I've got a question for those using my mod with the expansion: have you some problem with it (specifically with the shipset template files, as they lack the new ship classes added with "Retribution")? As I promised, today I'm releasing the update 3.5 for my mod. As always, you can reach it here . Happy Easter folks! I hope you'll have fun today. 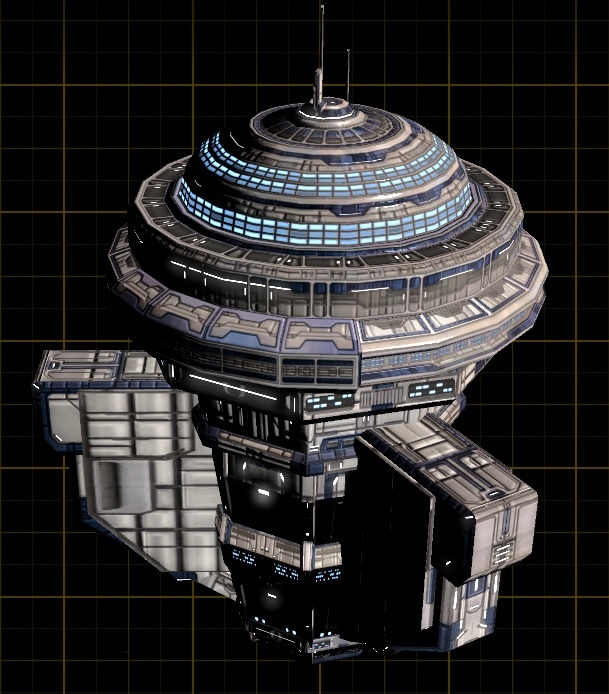 Just passing by to inform you that, even if I haven't started yet to work seriously on a new update, I'm tinkering with ideas popping in my mind from time to time, like this one for example (a prototype lvl 0 starbase - what you think of it? ).